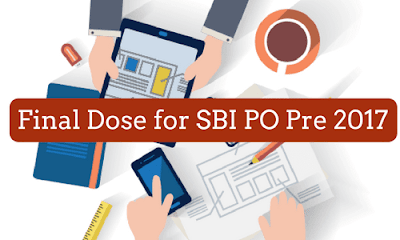 We know that you have been working very hard so far when it comes to preparing for the SBI PO exam but during last 2-3 days before the exam there is only one worthwhile thing that you should adopt and that is: mental relaxation. Studies show that increased tension/pressure to perform is actually detrimental to one's final performance. So, our only humble advice to our Dear Readers will be to relax a bit and focus on revising what you have learned rather than taking a run into unidentified terrain. So, so you stop giving attention to Reasoning, D.I. or Quant? "Absolutely Not". There is not a single topic that is not important and does not require your attention but in the last week you have to work with a different strategy. Its time for more smart work and comparatively lesser hard work. Its just that you should lower the frequency of solving the number of those questions a little and focus more on working on your speed and that happens only by taking model tests in the stipulated time. Try writing all the formulae and shortcuts used on a blank paper, again and again, to make sure that you don't forget the formulae while solving a question as that will be the worst blunder that can happen to a candidate. Remember guys this is not the time to start from scratch, this is the time to strengthen what you have already learned. Speed is the key and accuracy is the only requirement to succeed in the online test and practice/model/sample papers is the path to achieve this. Don't forget to unwind a little by taking a walk in the park or listening to music or even watching a little TV ( watching the news where you could get updates on local & global developments sounds like a must if you haven't been doing that lately). Exercise a little every day (you anyways should exercise everyday) as it results in blood circulation throughout the body and promotes good sleep, digestion and overall health which in turn results in improved performance of an individual. Keep your admit card and other important things packed and ready. Make a strategy in terms of which sections you are going to attempt first and don't hesitate to change that order at the time of actual exam as you don't know how and in which way you would move ahead in terms of solving the questions. Take the final decision as per the requirement of the real situation. Don't be late for the exam and please don't take up new topics minutes before while you are waiting for the exam at the centre as you are likely to mess up with concepts that you know.